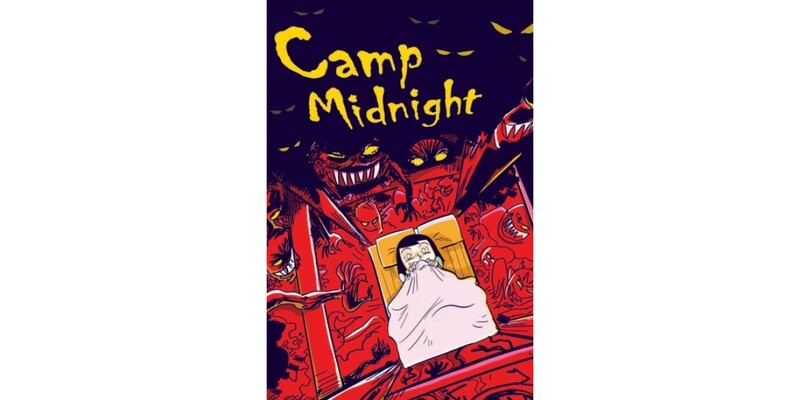 CAMP MIDNIGHT—the upcoming original graphic novel by Man of Action's Steven T. Seagle (Ben 10, Big Hero Six) and New Yorker contributing cartoonist Jason Adam Katzenstein—will release from Image Comics in April 2016. “When we first announced Camp Midnight at Image Expo we were expecting it to be a fun all-ages book that retailers would latch onto for the Halloween holiday, but we didn’t anticipate the level of early enthusiasm we’d receive from the mass market as well. In favor of giving Camp Midnight more time to find this wider audience we’ve decided to reposition the book for Spring 2016 and look forward to seeing this title thrive,” said Eric Stephenson, Publisher at Image Comics. CAMP MIDNIGHT tells the story of reluctant teen camper Skye, who is accidentally sent to the wrong camp for the summer. In an effort to spite her "step monster," Skye is dead-set on not fitting in. Luckily, that won’t be a problem as everyone at Camp Midnight—with the exception of fellow camper and fast-friend Mia—seems to be a full-fledged monster. Can Skye keep her identity as a human secret until she catches the bus back home? Is all of this a figment of her overactive imagination? And what about Skye’s major crush on a boy who is far (really far) from her usual type? CAMP MIDNIGHT is set to make its splash just in time for Book Expo America, the American Library Association’s Annual Conference in the summer, and of course San Diego Comic-Con. CAMP MIDNIGHT (ISBN: 978-1-63215-555-9) is an original, 248 page graphic novel from the Man of Action imprint of Image Comics and will be available in comic book stores on Wednesday, April 6th (Diamond Code: AUG150485), and in bookstores on Tuesday, April 14. Man of Action Entertainment, the bi-coastal creative studio and writers' collective, started in 2000, created the megahit Ben 10, a $4.5 billion dollar boys' action empire that has been called the most successful superhero launch of the past decade, and Generator Rex, both for Cartoon Network. Man of Action Entertainment consists of creators and acclaimed comic book writers Joe Casey, Joe Kelly, Duncan Rouleau and Steven T. Seagle, having collectively worked on the largest franchise characters in comics from Superman to X-Men before refocusing on creating worlds and characters for their own original work published through their Man of Action imprint at Image Comics. Man of Action returns to serve as Executive Producers on a new Ben 10 animated series for Cartoon Network and Dentsu handpicked Man of Action Entertainment to create, write and executive produce the all-new Mega Man animated series. Man of Action served as co-Executive Producer and writer for Marvel's Ultimate Spider-Man and is currently an executive producer/writer for Marvel's Avengers Assemble on Disney XD. Beyond the world of animation, Man of Action has created wildly successful video games, toy lines, comic books, stage productions, as well as forthcoming feature films and live action television shows, most based on their own original comic book series and graphic novels. Disney/Marvel's Academy Award®-winning feature Big Hero 6 utilized the characters and team created by Man of Action, as credited in the film's main titles. The film marked both the first time Disney turned Marvel comic book characters into an animated film and the first film based on comic book I.P. to win an Academy Award®. Upcoming projects based upon Man of Action creations include The Great Unknown, KAFKA, Officer Downe, I Kill Giants and The Crusades with Man of Action producing them and in most cases, the individual Man of Action also wrote the screenplay adaptation of their original creator-owned work. Officer Downe has wrapped production and I Kill Giants and The Great Unknown are in pre-production as feature films.